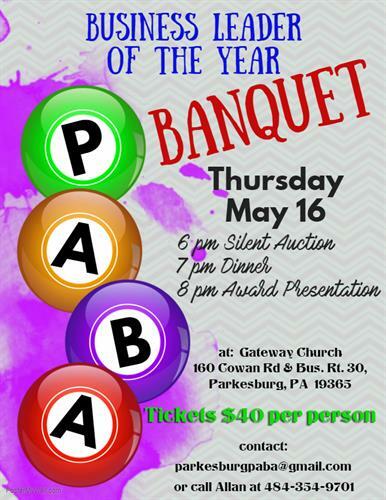 Join us as we celebrate our 2019 Business Leader of the Year and Award Scholarships to a Octorara Area High School and The Parkesburg Point student. Take part in the silent auction full of items from your favorite local businesses to help fund next year's scholarship award winners. Please join us at Gateway Church for a night of fun and celebration! Cocktail hour starts at 6PM and dinner is served at 7PM. Awards take place directly after. Tickets are $40 per person and can purchased by email (parkesburgpaba@gmail.com) or by calling Allan at 484-354-9701.